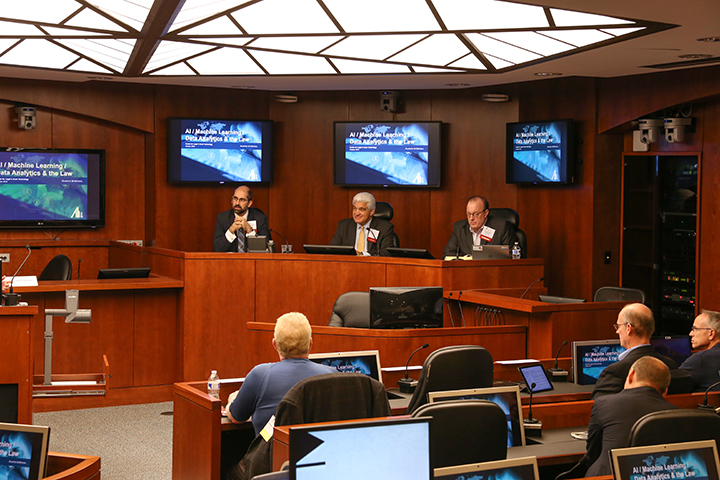 On October 26 and 27, 2018, the Center for Legal and Court Technology (CLCT) hosted its 2018 International Workshop: Legal Issues Lurking Behind the Convergence of Artificial Intelligence (AI), Internet of Things (IoT), and Blockchain. The program featured a keynote speech, followed by three area-specific panels. The event’s speakers represented legal, business, academic, policy, and technical perspectives from the U.S., Canada, and Europe, which cultivated lively discussions about the challenges, opportunities, applications, and limitations of emerging technologies. The workshop was made possible through the generosity of CISCO Systems, Inc. Funding for a dinner for speakers was provided by the Reves Center for International Studies at William & Mary. The full event program and speaker bios are available here. 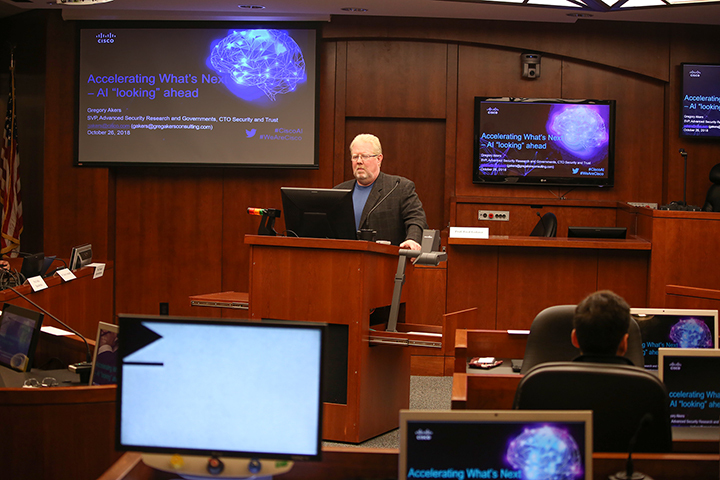 Gregory Akers, Senior Vice President and Chief Technology Officer at Cisco Systems, Inc., kicked off the event with his keynote speech, acknowledging the importance of growing collaboration between lawyers, business people, and technologists. Mr. Akers drew upon his expertise in computer science to provide a technical overview of AI, machine learning, and many of the promising technological applications that exist today. He also emphasized the nuance and complexity created when AI, blockchain, and IoT interact, using the example of autonomous vehicles to demonstrate how this coordination both enhances capabilities and creates new issues. Mr. Akers was optimistic about the future of these technologies, noting that events like the 2018 International Workshop are critically important for discovering the legal questions embedded in the use of AI, IoT, and blockchain. The Workshop proceeded with three panels, moderated by William & Mary Law Professors Fred Lederer and Iria Giuffrida, alongside University of Montreal’s Law Professor Nicolas Vermeys, who manages the Autonomy through Cyberjustice Technologies (ACT) Project, a major research partnership with which CLCT collaborates. 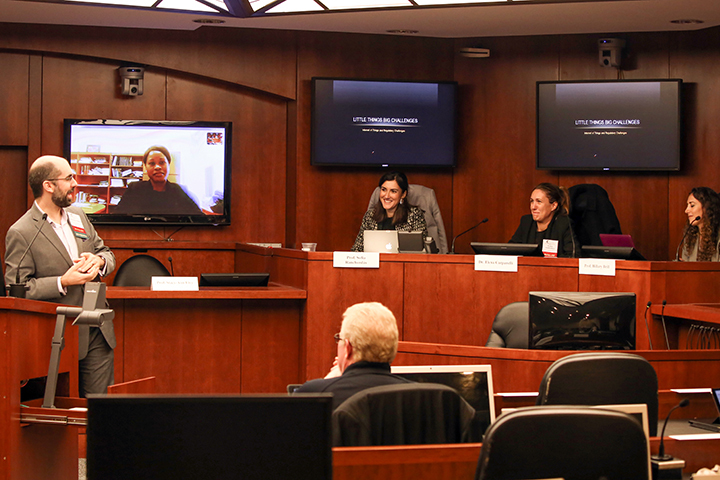 This firs t panel surveyed the practical applications of AI technology, including data analytics and the development of automated legal decision-making tools, with comment on the legal challenges created by these tools. Of note was the distinction between AI for decision-support (where humans remain the ultimate decision maker) and automated decision-making, demonstrating that the legal issues related to AI will depend not only on the tool’s function, but also on the nature and extent of its autonomy. The blockchain panel explored blockchain applications, like “smart contracts”; practical challenges, like security limitations, translating imprecise legal terms into smart contracts, and risks of surreptitious influence; and the difficulty in regulating blockchain, cautioning against overregulation without sufficient understanding of the technology. Some of the speakers warned that the hype surrounding blockchain technology may obscure the optimal uses of blockchain leading to a one-size-fits-everything solution (as Martin-Bariteau quipped “‘Can’t you just blockchain me that?’ No.”). In response, the panel, particularly Wright, reiterated that blockchain is ‘regulatable’ indirectly through regulations affecting the Internet, blockchain users (including mining pools and crypto-exchanges) or software/hardware. The final pa nel concluded the Workshop on a high note, inspiring dynamic discussion about the expanding universe of data produced by connected devices. Touching on topics from criminal procedure concerns in smart cities to the contract and products liability risks of IoT devices, the industry specific concerns to broader privacy questions, and the potential for IoT abuses to violate human rights law, the IoT panel illustrated that the legal issues associated with IoT are as varied and far-reaching as the technical applications themselves. The 2018 International Workshop received an overwhelmingly positive reaction by those in attendance. 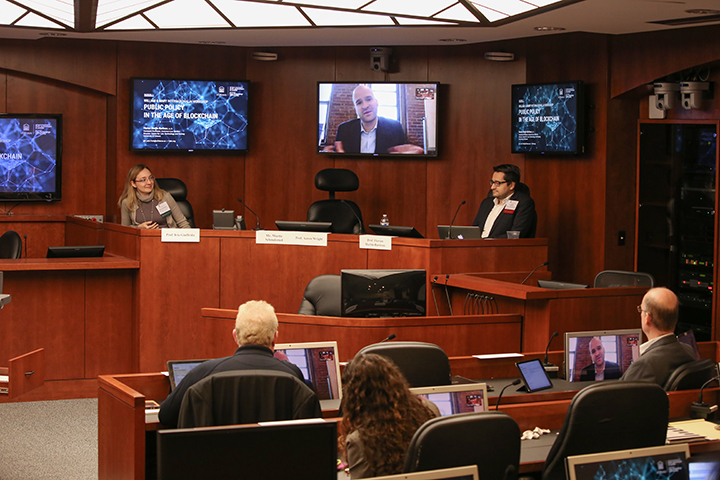 The events concluded with resounding support for “reconvening” a follow up workshop in 2019 to continue exploring the intersection of law and AI. Attendees were particularly impressed with the quality of speakers and material throughout the two-day long workshop. One law professor from D.C. remarked that “I learned more at this workshop than any other AI conference I have attended,” adding that every presentation brought new information and fresh insights. William & Mary Law students were also well represented in the audience and reveled at the opportunity to interact with thought leaders from various industries and countries. 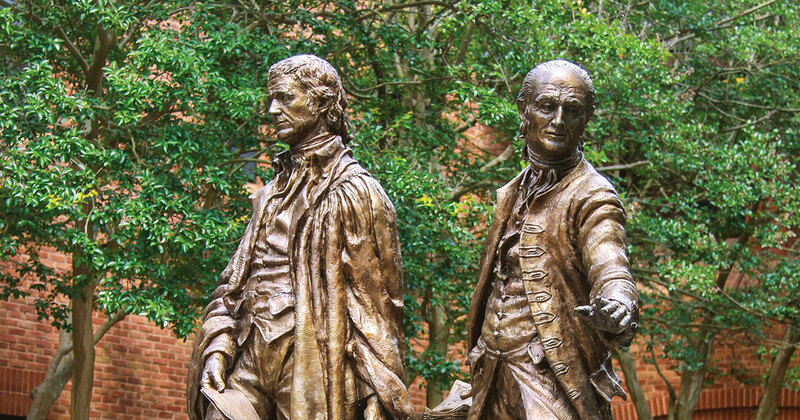 According to first-year Mark Garrett (J.D. 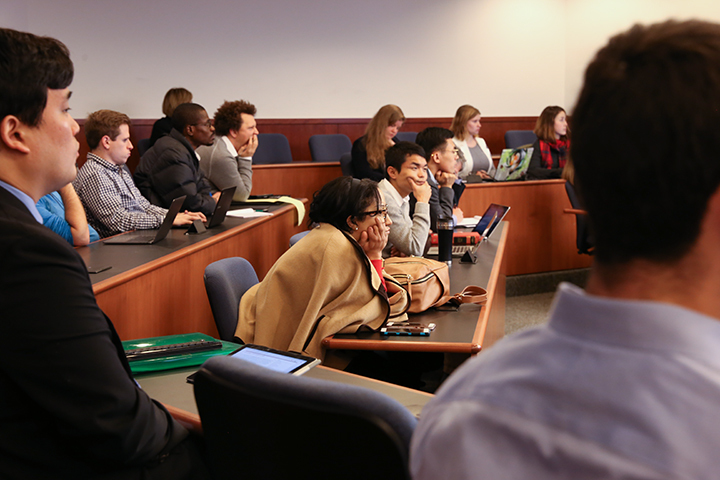 ‘21), “Attending this workshop was an amazing opportunity for my legal education. 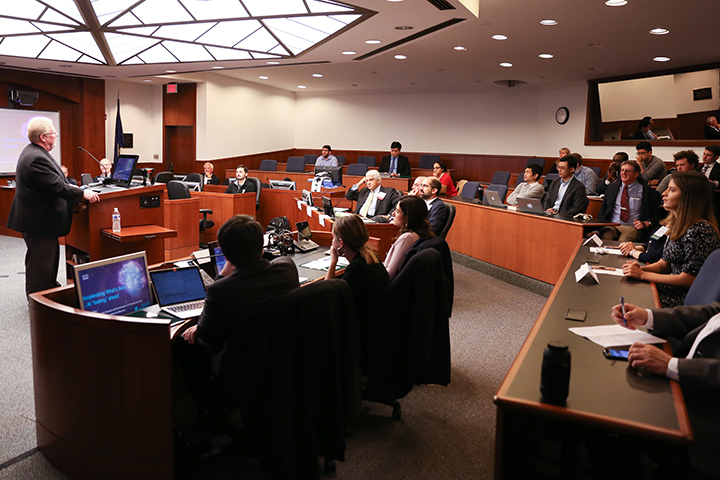 The presentations by these world-class experts broadened how I thought about technology and its relationship to the legal system.” The event even inspired some upper level students to register for CLCT’s ground-breaking course “AI, Emerging Technologies, and Their Effect on the Legal Landscape,” offered for the second time in the 2019 Spring Semester. Stay tuned for more on this course and other CLCT efforts related to AI research to follow in an upcoming alumni newsletter. Looking for More Information, or Interested in Collaborating on AI Research? Follow CLCT on LinkedIn, Twitter, and Facebook. Visit our website. Contact Professors Fred Lederer at [[w|filede]] and Iria Giuffrida at [[w|igiuffrida]].